Steven Pressley thinks the manager's job at Dundee United is "an exceptional opportunity" but says he is not interested in a return to Tannadice. The 41-year-old was in the running for the United post in January 2013 a there was fresh contact after Jackie McNamara left the club this week. "I know there's an interest there," said Pressley, who spent three years as a player with United in the 1990s. "But I don't want to come back to Scotland at this moment." 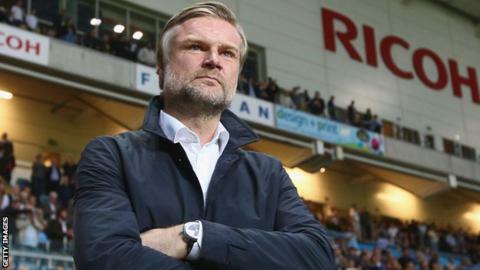 Pressley was sacked by Coventry in February after the Sky Blues slipped into the League One relegation zone. However, the former Scotland defender is determined to succeed in England and has lofty ambitions. "I have built up a very good reputation in England and I have a burning desire to manage at the elite level," he told BBC Radio Scotland's Sportsound. "That's not an arrogance. That's a belief. In order to do that, I think you have to manage in a country like England. "I think the right opportunity will arise for me here over the next coming months." Pressley cut his teeth in management at Falkirk after a spell as an assistant to Scotland boss George Burley and is sure his grounding in the game will serve him well. "My first five years in management could not have been more challenging but I wouldn't change them," he added. "Most managers now want to come in at the highest level but I think you have to do an apprenticeship. "At Falkirk I had to reduce the playing budget by close to 75% in three years. At Coventry we reduced the playing budget by 60% in two years - that was four years work that we put into two. "I'm very proud of the work that we did but my next job has got to be one where I'm not asked to tidy a club up. "I want to have the opportunity to build on somebody else's work and really have a go at it. I think I've earned the right to do that. "That's why my next job is a very important one."